Many of the kids brought their space-themed pajamas, sleeping bags, and pillows for the night at the museum. Space Shuttle Discovery on display at the Udvar-Hazy Center in Chantilly, Va. The Brown family (left to right) Malachi, 12; Lisa Nelson-Brown; Will; and Maiyah, 7, go on a scavenger hunt at the museum sleepover. The National Air And Space Museum's Steven F. Udvar-Hazy Center. Sean Mclaughlin (top, center) sits with a friend as they pick out their pilot code names. Audrey Strauss, 8 (bottom, left), tries on her decorative "nose cone", inspired by the nose cone of a plane. Nathan Ferraro, 10 (bottom, right), plays the role of a plane during a marshaling activity as his mom, Cora, takes a photo. 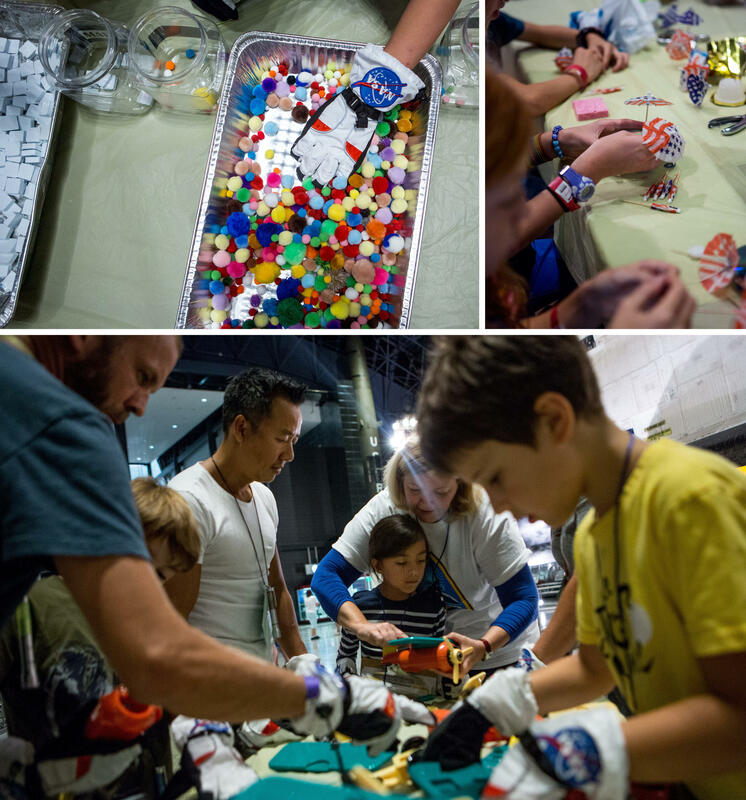 Kids participate in space-themed crafts and exercises, including trying to pick up small objects (top, left) and making their own satellites (top, right). Soraya Okely (bottom, center) gets help building a toy truck while wearing astronaut gloves as kids learn about dexterity in space. 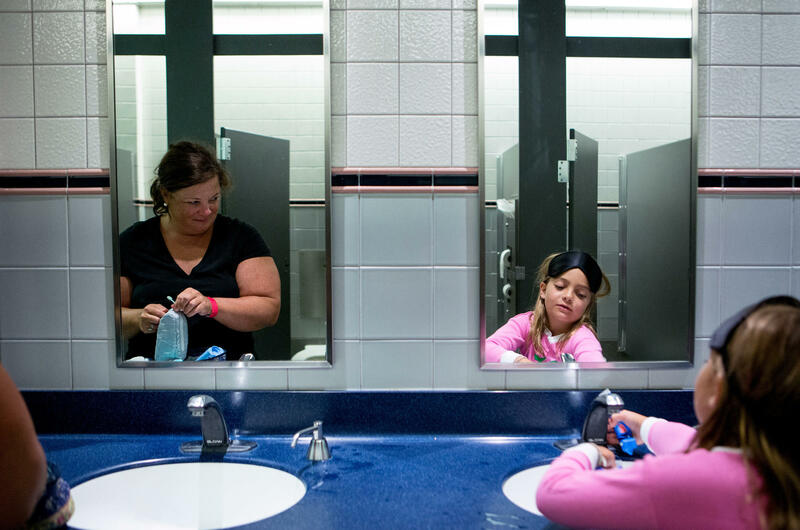 Pam Cross (left) watches her daughter, Healey, 8, as they brush their teeth in the museum bathroom before bedtime. Soraya Okely (center), her dad, Cadeyrn (right), and friend Eli Shroads, 9, examine their handmade satellites before bed. Visiting a museum full of airplanes and rocket ships is a pretty awesome field trip. Now imagine camping out for a whole night in Smithsonian's huge hangar outside Washington, D.C. You're there with a few other lucky kids, some grownups, and aviation treasures like the space shuttle Discovery. Sean Mclaughlin, 10, is one of those kids. He's picking out his pilot code name — using the aviation alphabet: Alfa, Bravo, Charlie, Delta, Echo, Foxtrot. He reads each word aloud, sitting just to the side of a F8U Crusader — the first carrier-based jet fighter to exceed 1,000 miles per hour. 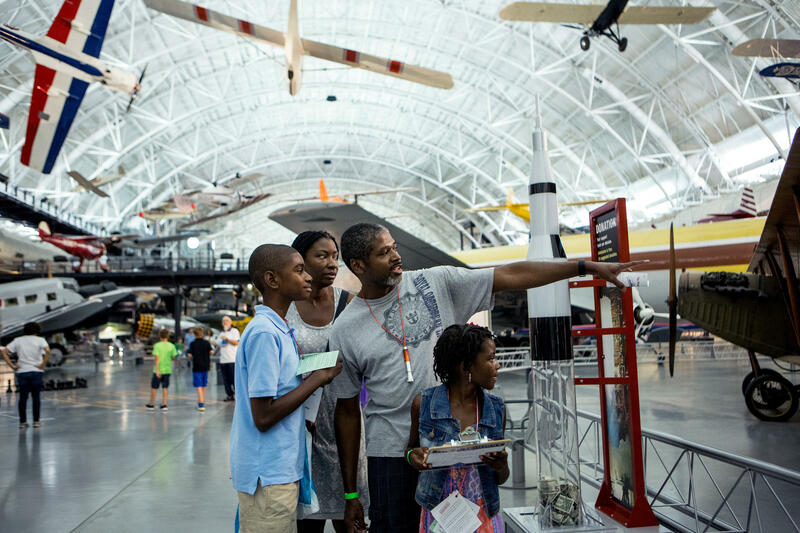 Sean finally settles on the perfect code name: Alpha Whiskey Yankee — the first step in his on boarding as a young pilot on this sleepover adventure at the Smithsonian's massive Udvar-Hazy Center. This was the first year the Smithsonian offered sleepovers at the center, also called the Smithsonian National Air and Space Museum's annex near the runways of Washington Dulles International Airport. The cost? $135 if you're not a museum member. Even though it was just about sold out this year, there are plans in the works for next summer. In a building the size of three football fields — full of airplanes, parachutes, helicopters and space capsules — there's plenty of room for activities. The kids arrived early in the evening, once all the tourists had gone, and quickly spread out over the giant space on an all-night scavenger hunt and quiz. Stops along the way included: making helicopters and learning to wave a jetliner safely into the gate. In the wing of the museum devoted to space exploration, I find Soraya Okely, 8. She says she'd like to be an astronaut some day. "The things that I've done so far: Do all these quizzes," Soraya explains. "I've worn the space gloves. It's awkward and hard, but it's also fun because after you de-construct a plane you get astronaut ice cream!" She'd like to go to Mars one day and this sleepover, she says, is good training. And that's kind of the point: There are volunteers throughout the museum offering tips and facts. Volunteer Harold "Woody" Davis greets kids as they shuffle towards the glass case of items astronauts took into space. There's a package that a group of boys claim is vomit — but it turns out it's just chicken and gravy. "What would you take to space?" asks Woody. "Would you take borscht? Would you take makeup? Pizza? Sean Mclaughlin — aka Alpha Whiskey Yankee — says pizza for sure. Or maybe French fries. He lives in Virginia not too far from the museum, and he comes here all the time. But tonight, he says, is special because he can take his time and read every detail, soaking it in. "It's pretty cool when you've got the place all to yourself," he says. " 'Cause no one else is here. Usually, when you come it's really loud and there's lots of screaming. I'm like, 'I can't read this!' "
The other magical things about tonight? You can fall asleep next to fighter planes from World War II. As 11 p.m. approaches, kids and parents are getting tired. You can feel the energy level dropping. The adults urge the younger ones to change their clothes and brush their teeth. It's a familiar routine — the only hitch is the automatic faucets in the industrial bathroom, which make it a bit hard to brush your teeth and wash your face. All the children must be accompanied by an adult. These chaperones are setting up the sleeping sleeping bags, air mattresses, cots. One dad even set up a free-standing hammock. Soraya Okely changes into her space-themed PJs, printed with Saturn, the moon and the Big Dipper. Soraya says that when she's falling asleep, she might say good night to all the space ships: "I hope I venture in you one day." I ask her what she expects to see when she opens her eyes in the morning. "I'm gonna feel like I'm in my house," she says, "but it's been extended with spaceships." Finally, everyone is zipped in for the night: pillows fluffed and stuffed animals tucked in — all in the shadow of the space shuttle's wing. As the museum lights go dark — these spaceships dip into the dreams of the little discoverers. The National Museum of African-American History and Culture is the newest museum to open here in the capital, and it's going to be packed for a while. 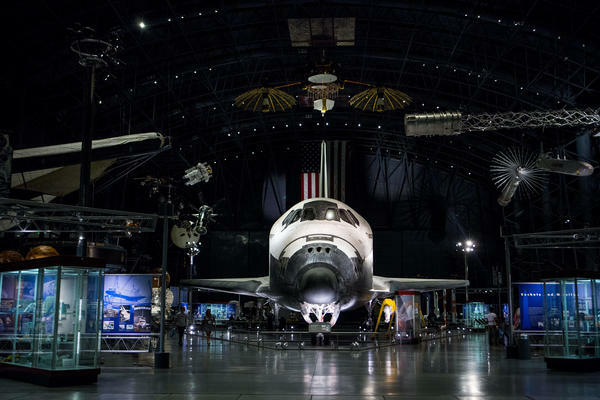 So if you're visiting D.C. and it's tough to get in, fear not - there are other places to visit that make for equally cool field trips. 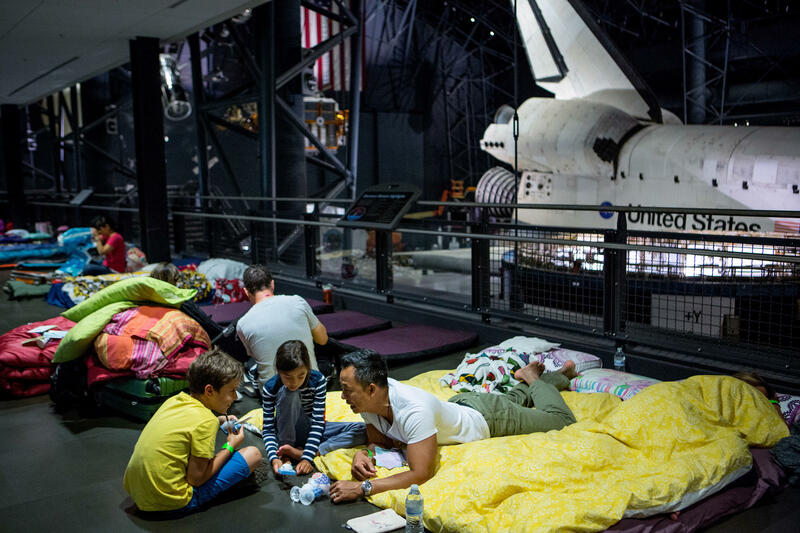 Imagine a sleepover at the Smithsonian National Air and Space museum's annex. 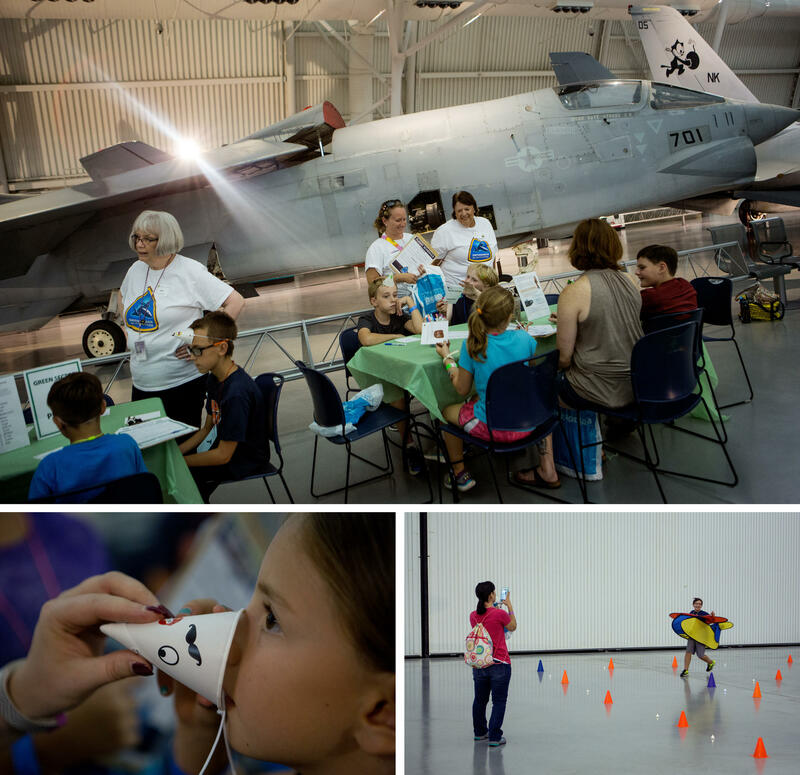 Elissa Nadworny of the NPR Ed team spent the night amidst airplanes and rocket ships. SEAN MCLAUGHLIN: Alpha, Bravo, Charlie, Delta, Echo, Foxtrot, Gulf, Hotel, India, Juliet. ELISSA NADWORNY, BYLINE: Sean McLaughlin is picking out his pilot code name, sitting next to the F8U Crusader. This fighter jet was the first to hit 1,000 miles per hour. It's about 10:30 on a Saturday night at the Smithsonian National Air and Space Museum's annex at Washington Dulles International Airport. Sean is a 10-year-old from Virginia, and he's using the aviation alphabet. NADWORNY: That's a good one. Sean's new code name is the first step in his on boarding as a young pilot. There's lots of other things happening in this giant, brightly-lit aviation hangar. It's like three football fields full of airplanes, parachutes, helicopters and space capsules. 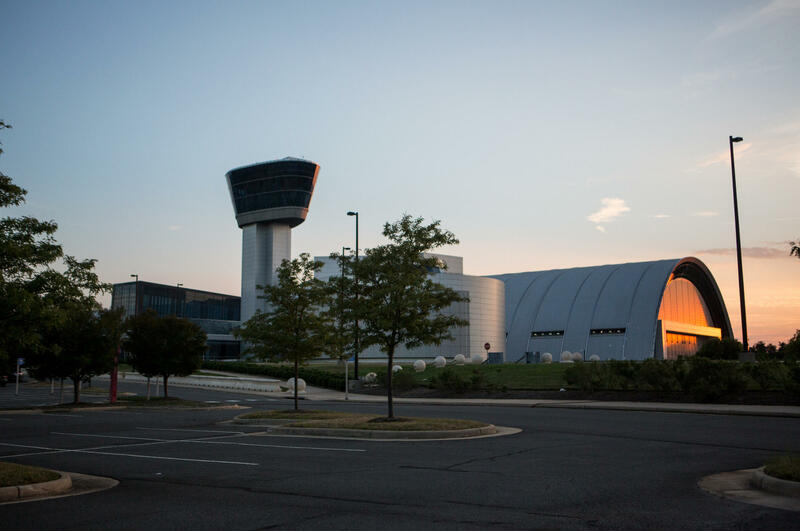 This is the first year the Smithsonian has offered sleepovers here at the Udvar-Hazy Center. The cost is 135 bucks and has been just about sold out all summer. Tonight, kids are making helicopters, they're learning to signal an airplane safely to a gate, and there's an all-night scavenger hunt and quiz to get kids familiar with the museum. Over near the space section, I find Soraya Okely. She's 8 years old and says she wants to be an astronaut someday. SORAYA OKELY: The things that I've done so far is do all these quizzes. I've worn the space gloves. It's awkward and hard. But it's also fun 'cause at the end of one exercise where you deconstruct the plane you get some astronaut ice cream. NADWORNY: She'd like to make it to Mars one day. Tonight, she says, is really helpful in getting her prepared for that. And that's kind of the point of this sleepover. There are volunteers like Harold Davis, who everyone calls Woody. They're asking questions and offering tips and facts. HAROLD DAVIS: So what would you take to space? Would you take borscht? Would you take makeup? Would you take pizza? NADWORNY: Sean McLaughlin, aka Alpha Whiskey Yankee, said he'd take pizza or maybe French fries. He's actually already thought about it. He doesn't live too far from the museum, and he comes here all the time. But tonight is special because he can take his time reading every detail and soaking it in. SEAN: It's pretty cool when you've kind of got the place all to yourself 'cause no one else is here. And usually when you come it's really loud and there's, like, a whole bunch of screaming. I'm like, I can't read this. NADWORNY: The other magical thing about tonight? You can fall asleep next to fighter planes from World War II. UNIDENTIFIED MAN: OK, Lucas (ph), take your pajamas, please. Thank you. NADWORNY: As 11 p.m. approaches, kids - and the adults they brought with them - start to get ready for bed. Soraya changes into her space-themed PJs printed with Saturn, the moon and the Big Dipper. Are you going to say goodnight to all the spaceships? SORAYA: I'll say, see you next time. I hope I adventure in you one day. NADWORNY: Kids zip themselves in for the night, squeezing their pillows and stuffed animals just a few feet away from the right wing of the massive shuttle Discovery. As the museum lights go dark, these spaceships dip into the dreams of these little discoverers. Elissa Nadworny, NPR News, Chantilly, Va. Transcript provided by NPR, Copyright NPR.